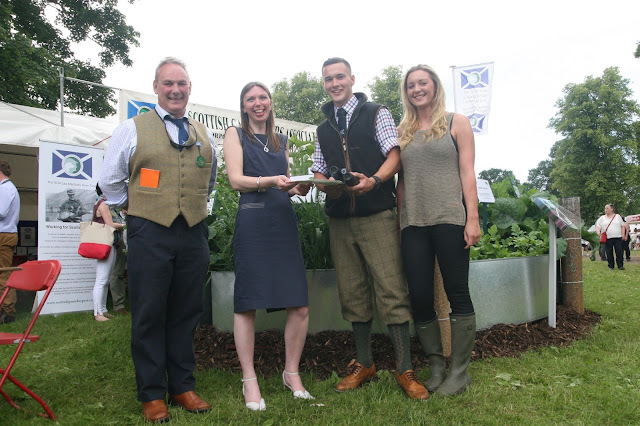 Duncan Seaton receives his prize at Scottish Game Fair by Environment Minister Dr Aileen McLeod, watched on by SGA Chairman Alex Hogg and Duncan's partner, Jennie McCallum. A highlander whose first interests were in shepherding and horses has been named the 2015 Scottish Gamekeepers Association’s Young Gamekeeper of the Year. Duncan Seaton (20) from Dores near Inverness was presented with his prize yesterday (fri) at Scottish Game Fair by Minister for Environment, Climate Change and Land Reform, Aileen McLeod, and SGA Chairman Alex Hogg. The sought-after award recognises modern wildlife managers whose approach brings benefits to Scotland’s diverse flora and fauna and makes them youthful ambassadors for their profession. Duncan, who has just completed an HNC in Gamekeeping with Wildlife Management at North Highland College UHI, was selected from a final short-list of three. His experience of a broad range of management, and his work in educating children about responsible gamekeeping, saw him triumph over a very strong field of nominees covering the whole of Scotland’s land, lochs and rivers. Duncan first became interested in land management when helping out his father, a psychiatric nurse, who also did some contract shepherding work. Having also a keen interest in horses, he decided to pursue his current career after admiring the work of the ghillies with their garron hill ponies on a nearby estate. Whilst with his current employer, Dunmaglass Estate, Duncan has helped with school visits, with local kids learning about the benefits of multi-species management. “I am delighted to receive the award. It is a real honour in our profession,” said the youngster, who started out as a Modern Apprentice. At Dunmaglass, Duncan works encompasses pheasants, grouse and Stag and hind stalking as well as looking after the Curlews and other birds which make the estate their home. “I’m delighted to present Duncan with the Young Gamekeeper of the Year Award 2015 and congratulate him winning this prestigious award. The nominees put forward are all of a very high standard and I’d like to thank them all for their hard work in contributing to the prosperity and enhancement of our wonderful countryside and wish them well in their careers. “Without this significant and valuable contribution to the management of Scotland’s countryside we would not have the world-famous landscapes which many people from home and abroad enjoy and which makes such a valuable contribution to Scotland’s rural economy.